Railpictures.ca - Matthew Tozier Photo: Amtrak GE P42DC 110 leads VIA 97/AMTK 64 Maple Leaf at the St. Catharines VIA Rail station on the CN Grimsby Sub. Heading east towards Niagara Falls, ON. And later on, New York City. Also an interesting thing to note, the crossing just a little past the station, Louth Street, Had it’s gate ripped off by a Truck. So the crew had to flag it while it pulled into the Station. | Railpictures.ca – Canadian Railway Photography – photographie ferroviaire Canadienne. 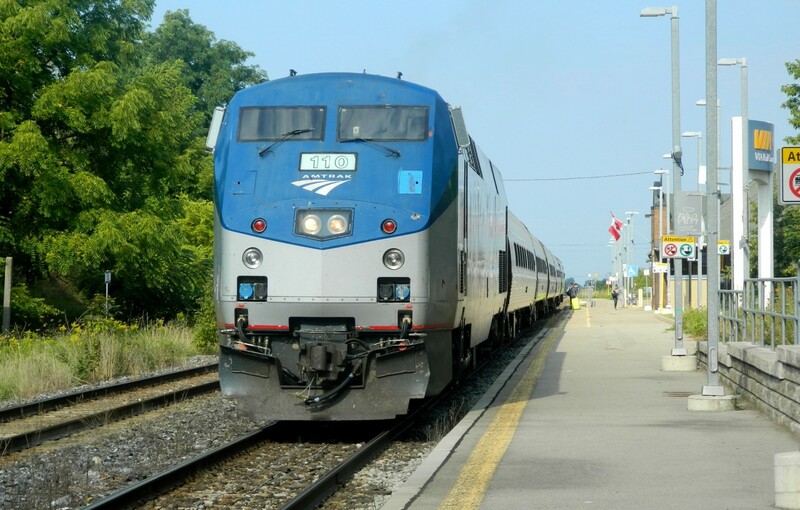 Caption: Amtrak GE P42DC 110 leads VIA 97/AMTK 64 Maple Leaf at the St. Catharines VIA Rail station on the CN Grimsby Sub. Heading east towards Niagara Falls, ON. And later on, New York City. Also an interesting thing to note, the crossing just a little past the station, Louth Street, Had it's gate ripped off by a Truck. So the crew had to flag it while it pulled into the Station. Thanks everyone, I hope to get more pictures up before the year’s done.